Letting friends know “Whats up?” since 2005. 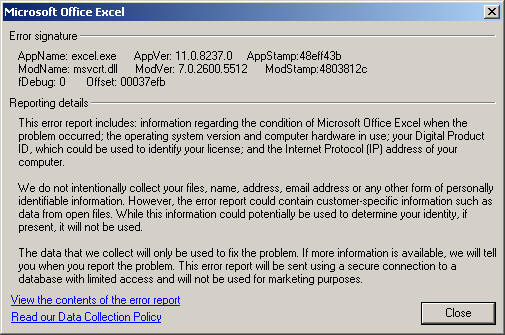 Microsoft Office Excel 2003 crashes on exit! 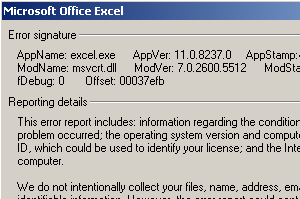 Microsoft Office Excel 2003 crashes every time I close it! 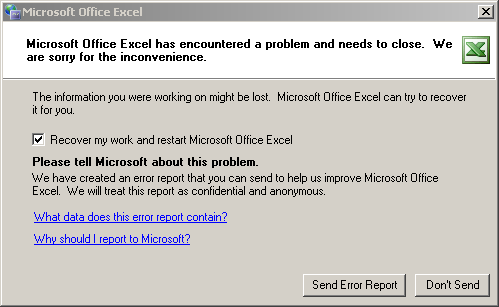 Microsoft Excel has encountered a problem and needs to close. We are sorry for the inconvenience. Reinstalling or repairing Office or Excel does not fix the problem! Microsoft Office Word 2003 will not save! 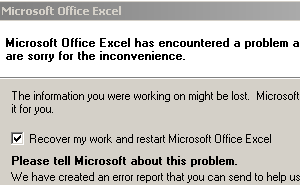 I have encountered a similar problem in Word that can be fixed the same way as the above excel crash. This entry was posted on Wednesday, February 4th, 2009 at 19:57:06	and is filed under English. You can follow any responses to this entry through the RSS 2.0 feed. You can leave a response, or trackback from your own site. thanks man, took whole day to find your solution and amazingly it fixed the problem! Thanks! Had this problem also and it’s solved now. Thanks! I had this problem also. It was very annoying. All medion e1210 netbooks have this problem due to their factory setting. I prepared a Turkish blog entry about the problem for Turkish users and cite your page. This is real solution. Not the update SPxxx or reinstalation. The problem is specific and you who mfind the solution are genios. Thanks a lot! I spent considerable time troubleshooting this problem, until I stumbled on your blog. Ran into this problem right after painstakingly setting-up my new system. Very happy to have found this. Thanks a lot. Had the same problem and it’s solved now with the registry modification. Thank you so much! I was so bothered with this problem that even thought of buying new laptop. Now all fixed.